If there was a Mt. 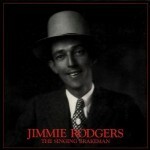 Rushmore for Country Music, Jimmie Rodgers’ would be right next to Hank Williams, Patsy Cline and Johnny Cash. Although his life was cut short by tuberculosis a scant 6 years after it started, Country music begins and ends with “The Singing Brakeman.” He was also the first artist to be inducted into the Country Music Hall Of Fame. Posted: May 21st, 2011 under Country, Music.